While we cannot predict Black Swan events (they are too rare) we can gauge how fragile or resilient a system is to shock. For instance, given a crystal glass and a brick wall, I cannot predict with certainty what event will eventually destroy either object, but I can be certain that it will take far less for the crystal glass to be broken than it will for the Great Wall of China. We can imagine a scale which measures the behaviour of objects when faced with a volatile environment. 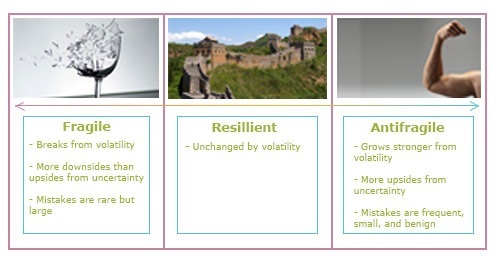 The glass at one end, is easily destroyed by rapidly changing conditions, in the middle we have resilient objects, like The Great Wall, that can resist volatility for a long time. At the other end we have objects that actively thrive from volatility (within limits), like the mythological Hydra whose heads would multiply with each decapitation. Nassim Taleb coined a word for such a trait: anti-fragility. It pays to be anti-fragile. 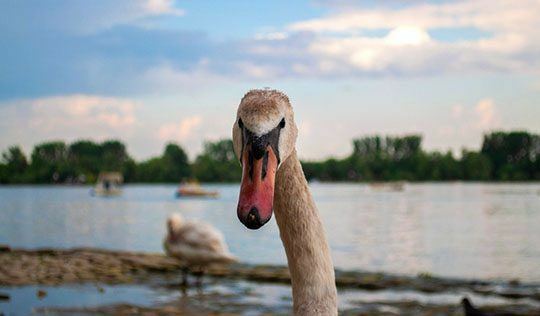 At its core, being anti-fragile is a strategy to maximise exposure to White Swans while minimising that to Black Swans. Anti-fragility moves us beyond mere resilience; it actively grows stronger from chaos. With time to rest, torn muscle will grow past its original size. With enough time to heal, fractured bones will grow stronger in the broken places. A forest will flourish from occasional fires that eradicate old biomass. With the right mental tools, even our psychology can help us grow from difficulty. At the extreme of difficulty it can be referred to as Post-Traumatic-Growth, the healthy counterpart to PTSD. Anti-fragility is a common feature in nature, yet it’s a rare find in businesses or people’s careers. How does this concept translate into pragmatic strategies? Diversify, diversify, diversify: When you can’t predict, you better be flexible. As a company, this could mean expanding into new markets or creating new products that are less likely to be impacted by movement in old markets/products. As an individual, you might be expanding your professional skills-set or working on a side project. On the flip side this implies that over-optimisation, or specialisation, can create fragility. How might you introduce greater flexibility in your business and life? Add redundancies: Limited resources can become grave bottlenecks in times of crisis. How much of a buffer would you like between you and bankruptcy? Are you keeping an eye on cash flow? How many savings have you got? Where possible, you don’t want to put all your eggs in one basket, like KFC did when switching delivery providers resulting in hundreds of its restaurants closing for lack of chicken. Seek out novelty: This helps you diversify, learn, grow, and more… If you are used to change, if you are continuously adapting, if you learn to make discomfort your friend, you will be psychologically ready for the day you meet that Black Swan. Rather than being overwhelmed, you might approach this new challenge with curiosity and exploration. Barbell Strategy: This is a method of playing it safe with most of your resources while taking many small risks in other parts of your business/life. Some stock traders do this by keeping most funds (say 80%) in relatively safe stocks while gambling on higher risk trades with the other 20%. Within a business, you might be dedicating 10% of time to moon-shot projects (i.e. Google gives their employees 20% time off to develop their own stuff). This is more effective than placing all your resources on a middle-risk project: it reduces the chances of a Black Swan completely wiping you out, while opening the door for White Swans to bring in unimagined gains. Explore more perspectives: Sometimes the only thing between us and fruitful avenues for growth is our point of view. There are likely many options out there that could help us take advantage of chance events. Yet, we don’t see them, because our current paradigms, don’t make those options apparent. How might you challenge your current view or model of the world? (Coaching can be a great space to explore). Networking: Meet people, at work, at parties, at talks, everywhere you go. Opportunities exist in every person you meet. I cannot count the number of times I’ve made a friend AND found a client, without actively looking for either, simply because I’ve learned how to connect with people. Networking is one of those few examples of activities with highly asymmetric outcomes, you have so little to lose and so, so, so much to gain. I will explore Networking further in my next blog but, for now, why not check out Aspire’s course on Networking to help you navigate professional relationships like a pro. If has piqued your interest do join us for a day of Strategic Planning to take your life, career, or business forward. Prepare yourselves for Black Swans, let’s stop thinking like a Turkey and make space on that strategic plan for a White Swan to swoop in with gifts.